Are you in search of “Paradise lost”? 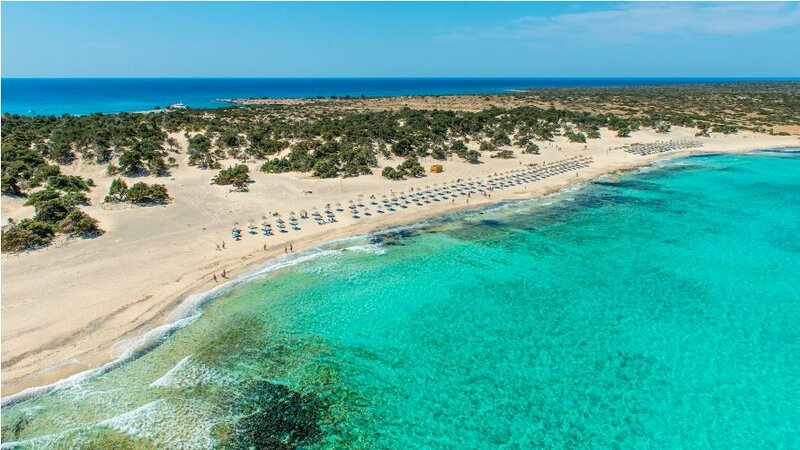 Chrissi Island or Gaidouronissi is the answer! A short drive to the east of Crete, which is the narrowest part of the island, takes us to the south coast with the picturesque town of Ierapetra, which is also the warmest and southernmost part of Europe. Here we'll catch the boat that will carry us over the ever-changing colors of the crystal clear waters of the Libyan Seas to the little island of Chrissi. If we are lucky, during the 8 km trip we will be accompanied by dolphins who swim and leap into the air just a few meters away from the boat . Suddenly there it is... the last land before the African coast, the golden Isle (Chrissi). This semi-tropical paradise has fantastic beaches, consisting of millions of multicolored crushed seashells, sparkling under the sun. There is plenty of time for you to find your own private spot to do some sunbathing, or to relax on the sand dunes under the shade of the trees. Walking through a beautiful cedar tree forest, probably the last existing in Europe, is a real pleasure. The island is now protected as an “area of Intense Natural Beauty” as it looks like the last paradise on Earth! Whatever you do on Chrissi Island, one thing is for sure: you’ll live Robinson Crusoe’s life for a day! *Swimming gear is a must!